Of all the photos I took while I was in Greece, this might be my favorite. 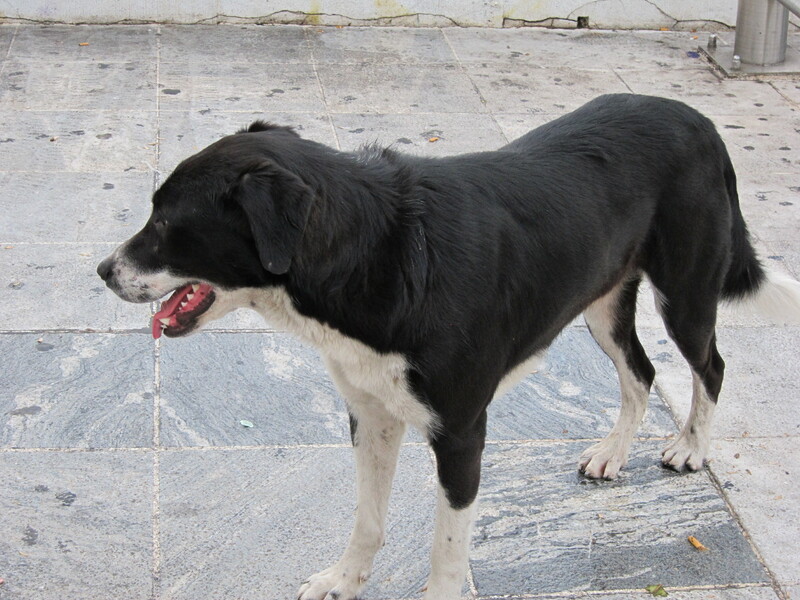 If you have ever been to Athens, you know that the streets are teeming with stray dogs. They are everywhere and basically have the run of the place. They sleep all over the Acropolis. They stand in the middle of the street with no fear of oncoming traffic. They are generally either friendly or indifferent to people, although some seemed a little aggressive. They are all mutts, and I don’t think they have homes, but overall they seem healthy enough. I’m curious as to the fate of these dogs since the rioting and unrest over the past year. This dog was my favorite dog during my stay. I saw her (I decided she was female, but I didn’t check) many places around the main tourist areas. She’s a sweet girl, very friendly but not pushy. Every time I saw her, she would come right up to my side and stroll with me for a few blocks as if we were friends running errands who meet each other on the street and chat for the time they are headed in the same direction. I traveled to Greece by myself. I was 26 and had never traveled abroad alone before. Although everyone was very kind, and many people spoke English, Greece can still be overwhelming. Almost every sign that isn’t on the main road is written only in Greek, and in tiny letters at that. The streets meander and take sudden turns, making it easy to get lost. There are panhandlers all over, some more aggressive than others. I was also there in January 2011, which is not tourist season, and just when the Greek debt crisis was becoming the serious issue that we know today, and there was a lot of tension in the air. My third or fourth night in Athens, I was walking back to my hotel after dinner around 11pm but I needed to stop by a bank ATM, doubling my distance. The streets were eerily quiet because many Greeks were resting up for a transportation strike the next day and there didn’t seem to be any fellow tourists around. I felt anxious and alone. Then this dog comes from around the corner in front of me, makes a beeline right to me, and proceeds to walk with me not just to the ATM, but continues to follow me to the tiny street my hotel is on, another 5 minutes away, whereupon seeing that I was delivered home safely, she trotted along her way. Her presence calmed me instantly and I was able to go about my business happily, without any lingering fear, just absolutely knowing I would be fine while she was with me. I love all dogs, but…there are always some dogs you connect with immediately and remember forever. She was one of them.